A submersible pressure transmitter or level probe is a hydrostatic pressure sensor, specifically developed for the purpose of level measurement. 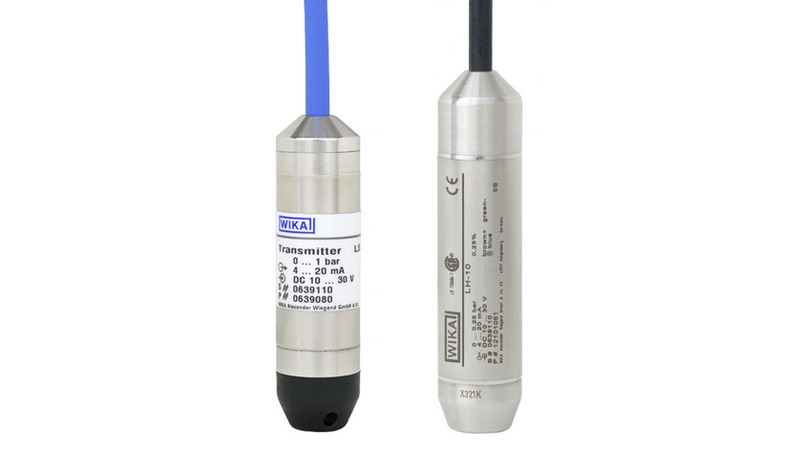 Submersible pressure transmitters, such as the WIKA model LH-20, are level sensors with special characteristics and specific technical features, which offer a maximum resistance and watertight sealing against the liquid being measured. Basically, submersible pressure transmitters or level probes are used in varying immersion depths and filling heights up to several hundred metres. They are used in the widest range of different media, and therefore must offer IP 68 ingress protection with unlimited time of immersion in the given measuring depth. The physical design of a submersible pressure transmitter is specifically optimised for the requirements of hydrostatic pressure measurement in immersion applications, and offers an unmatched watertight sealing and media resistance. In principle a submersible pressure transmitter can be divided into five different design elements: the sensor or measuring cell, the electronics, the housing, the cable entry and the cable itself. The measuring cell or the sensor of a submersible pressure transmitter is used for measuring the hydrostatic pressure at the measuring point. Even under the most severe conditions, in the measurement of media which is dirty, containing particulates or fibres, with abrasive contents or sludge, the measuring cell of a level probe must ensure accurate and reliable measurement. Even in the harsh applications of wastewater treatment plants, digester towers and in brackish water, the measuring cell or sensor guarantees highest process reliability. The main requirements on the measuring cell are thus a high resistance to contamination from the medium and a maximum durability. Specialised manufacturers, such as WIKA, therefore offer submersible pressure transmitters which are optimised in their physical design with a very specific choice of materials for each application, from stainless steel measuring elements to special ceramics. The electronics of a submersible pressure transmitter or level probe is very similar to those of a standard industrial pressure sensor. Here the electronics also convert the pressure signal from the measuring cell into a standardised industrial signal, with high accuracy, small temperature errors and optimised EMC protection levels. The most significant difference in the electronics of a submersible pressure transmitter over the electronics of a standard industrial pressure sensor is found in the application-specific use of level probes in outdoor operation and the thereby associated risk of lightning strikes. Thus, sophisticated submersible pressure transmitters, such as the WIKA model LH-20, offer a built-in overvoltage protection that is designed to minimise the effects of a nearby lightning strike and the voltage surge it produces on the pressure sensor. It is, of course, not possible for any instrument to survive a direct lightning strike without any damage, even with the best overvoltage protection. In my next article, “The design of a submersible pressure transmitter / level probe – Part 2“, I will explain further the technical design features and special attributes of the housing, the cable entry and the cable within the design of submersible pressure transmitters.